This is based on the effort to gain consensus around a single common definition for BPM. The definition by itself can not convey the meaning, if the terms are not explained. 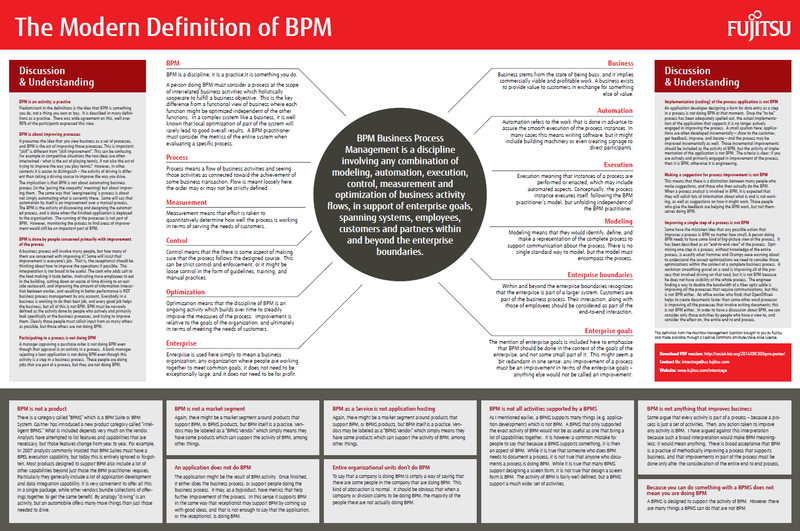 You have seen this before in my post “One Common Definition for BPM.” What we have done is to put all the information together into a single poster. It looks best printed 36 inches by 24 inches (90cm by 60cm). Most of us don’t have printers that big. You can print it in Acrobat across multiple pieces of paper, and tape them together, but that can be a lot of work. I am looking a way to allow you to simply order the poster and have it sent to you in a tube. Once I have found that, I will update the post here. Or come by the Fujitsu booth and ask for one. This entry was posted in BPM, Workflow and tagged BPM, business process, process. Bookmark the permalink.